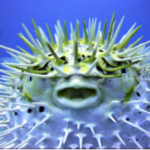 Dinosaur or Puffer Fish: Which One Are You? - Welcome Authors! Earlier this year, I realized that the Women’s Wealth Revolution™ needed its own revolution! And so I painstakingly went about the process of dismantling the old and reinventing who we are and why we exist. In so doing, some tough truths about the marketplace revealed themselves, which I’ll share in a minute. But first, a question for you: do you want to be a dinosaur or a puffer fish? Millions of years ago both species existed. Dinosaurs, the experts tell us, couldn’t adapt to the changing climate and vanished entirely. Puffer fish have been around since then and are a ninja species: to avoid predators, they can change colors to blend into their environment, puff themselves up to four times their normal size, and release enough toxins to kill 30 adults. Talk about an adaptable species able to weather the changing tides! Now, stop for a moment and honestly ask yourself: when faced with adversity and changing conditions, are you a dinosaur or puffer fish? The reason I ask is because now more than ever the old ways of doing business have stopped working well (this is especially true with the parts of your business that are online – and if you’re not online yet, you’re getting left behind). Whatever is working well now may in fact become obsolete sooner than you think. Most formulas, models, and strategies that were cutting edge just a few short years ago are losing their effectiveness at an alarming pace. So what should you do? 1. If you’re learning/following a model that’s been around for 2+ years, begin to innovate or you could become extinct soon. Don’t be that dinosaur; become part of what’s called the “pre-adaptive” group – those who stay ahead of the curve. Pay attention to the trends and leaders in your industry, and shift quickly and nimbly when needed. TIP: You can shift in small or big ways. Example of a small shift: make life easier for your customers with automated online bill paying. Example of a bigger one: completely rework your business model and/or programs to stay relevant, solvent and leveraged. TIP: You don’t have to go find your intuition. It’s been inside you this whole time. Chances are it’s a bit buried under layers of information and indoctrination. Clear all that out so that you can hear it loudly and regularly. It’s your inner GPS. Practicing contemplation, meditation, reflection, connection, and/or exercise are some of the best ways to do this. 3. Stop letting your Mind run the show. If you’re strictly relying on what’s between your ears to lead your business/life, you’re like the dinosaur AND you’re working way too hard for too few results. TIP: Engage your body and your spirit in addition to your mind when growing your business and making important decisions. Now that may sound odd or even like nonsense to you right now. However, think about how many times you get a gut feeling or sense that’s something’s right or wrong. How often do you say “I can’t put my finger on it…something just feels off…”? That’s your body’s intelligence at work. Similarly, how many times do “coincidences” happen (e.g. someone you’re thinking about happens to call, or a client lands “out of the blue”)? That’s your spiritual connection/law of attraction/the universe listening and responding to your inner desires and intentions. Imagine if you strengthened both body and spirit and used them as much as you do your mind. I invite you to give it a try and see what shows up.